Artists’ talks and discussion: Hilmar Fredriksen, Kurt Johannessen, Kjetil Skøien, Emily Promise Allison, Ann Noël, Lisa Tostmann and Irma Optimist. PAS final presentation by: Ingrid In der Maur, Yendini Yoo Cappelen, Hanne B. Nystrøm, Daniel Novick, Gabriela MB, Yağmur Taçar, Andrea van Gelder, Marion Horney, Alexandra Vasic & Sara Hermansson. Performance art is always created in relation to the present and in dialogue to the place and time it is in. PAO Festival 2018 Parallel times - performance now, is creating a platform where older generation performance artists come in dialogue with the younger generation. This years focus explore how performance art developed historically within its context and drawing lines to the present, examine how it is infuenced by its contemporary time. How have political, technological, media and other contemporary themes infuenced performance as expression? Artists already active on 80 / 90s, and artists born in the 80 / 90s will give us their interpretation of the present-day. Artists are invited to hold short performative presentations of their work and approach to performance. After the talks we open for dialogue with questions and answers between the artists and the public. We will show photography by festival photographer Henry Chan (CA) and video programme curated by Tanja Thorjussen of PAO with a programme from Kjartan Slettemark and Megan Toye (CA) with a programme from Franklin Furnace Archive NY. 27. October. - 4. November: Performance Art Studies PAS#60 “AGING AS ACTION” with BBB Johannes Deimling at KHIO - Oslo Art Academy. * 2 November: Opening, artist talks and group performance with participants of PAS#60. 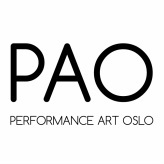 PAO Festival 2018 is supported by Fritt Ord, Norsk Kulturråd, Oslo Municipality / Kulturetaten, The Spanish Embassy in Oslo and CanariasCrea.